For the past few weeks, I have been doing some contract work at AdHack. It started out as an internship, and I was to write some case studies on the results of past clients who had used AdHack’s services, but it turned into something more. When the case studies were almost finished, James suggested doing an Olympic ad contest over the course of the Olympics and asked me if I was interested in running it. Of course, I agreed. I thought it was a fantastic idea. So that is how the Oly Awards came to be. The first thing we did was start a Flickr group to collect some of the advertising surrounding the Vancouver 2010 Winter Olympics. There was a ton of advertising around town, far before the Olympics even started. We organized a photowalk to get some of the initial photos in the pool. Our goal on the day of the Opening Ceremonies of the Olympics was to have 50+ members and 500+ photos. We wanted to make sure there were enough people interested in the Olympics ads project, and would be willing to submit their photos. Well, we rocked it. The Flickr group now has over 80+ members and 800+ photos. 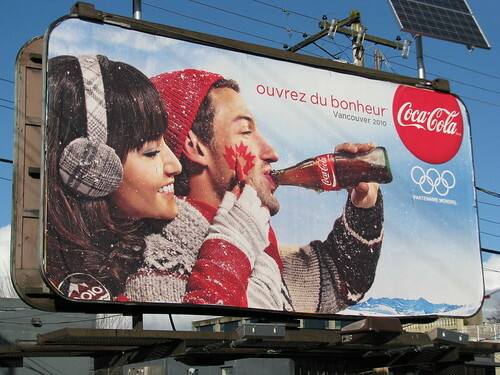 I started writing a blog post or two a day during the Olympics on the major brands that were Official Sponsors of Vancouver 2010. We got some feedback from some of those brands too, which was great! The next step was creating a photo contest at OlympicAdAwards.com. We set up a Strutta-powered contest for people to submit their best photos of Olympic Advertising. Our goal was to get 100 entries by the submission deadline. We got 115 entries and knocked it out of the park again. We gave them a detailed scorecard to fill out on each of the brands. They are all Vancouverites, but they also had our Flickr group of Olympic ads for a resource in their judging. By the way, a HUGE thank you to the Judges who took the time out of their day to do this for us. They gave great feedback in the comments on some of the brands as well. In the end, it was a tight race, but Coca-Cola with their Open Happiness campaign beat out the Hudson’s Bay Company by three points! Congratulations Coca-Cola, you did a fine job. For Best Photo, there were 10 finalists chosen by public voting, from the 115 entries. In the end, Kim Werker‘s photo of the Hudson’s Bay Company won the popular vote. Congratulations Kim! View AdHack’s announcement on the blog, or view the official press release. Well, that’s that. My Olympic project has come and gone. It was a blast, and so interesting to see what developed over the 17 days of the Olympics. Not only in regards to local, national, and worldwide advertising, but in being a Canadian, and a proud Vancouverite, and witnessing the best party Vancouver has ever thrown. I am so lucky to have taken this role and to have been a part of the Olympics while they were here in Vancouver in 2010. I’d do it all over again in a heartbeat. And now… a new adventure? I think so! Good job Janis! What a fantastic project. We’re really impressed with how it all came together because of all of your hard work! Too bad a job reference from one’s older brother is worth a hot cup of jack squat! Seriously though- excellent work. I’ll finish a full case study this week.